I miss your bentos very much and today i am very excited to find out that you already posting the new one. What a cute bunnies! ooo..I miss tempeh very much. Happy Easter to you too Lia! Hihihi, bunny tempe-nya lucu...itu pakai cutter atau manual mbak? The bunnnies are so cute! What a fun lunch :D It sounds like the kids really enjoyed their break! I can't believe the school year is almost over! Hi Lia, your tempeh bunny are too cute. Did you cut the tempe before you fry it or after? it looks so neat!! great bento as always!! Delish!! Happy to see you back in Bentolicious, I thought now you have your Bloglicious you would spend more time in your new blog ;). But I like both blogs, your photos are always very aesthetic and mouthwatering...! Oh I never think to buy tempeh. I bet my little ones would like it. Thanks for sharing your post. 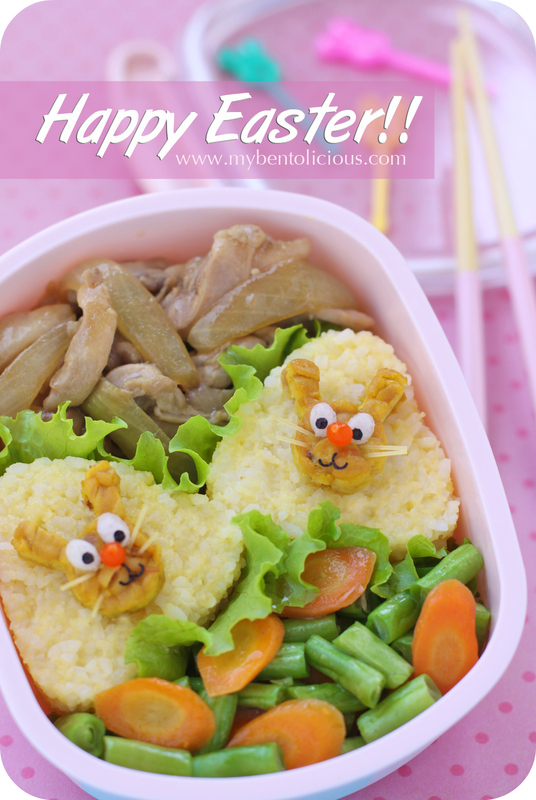 @CG : I will still post bento everytime I make it for my kids and will make a post for My Bloglicious from time to time. Thanks a lot CG for your sweet comment!